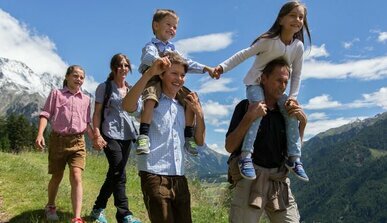 The MMM Ripa at Brunico Castle is the fifth of the museums by Reinhold Messner and is dedicated to the mountain tribes. 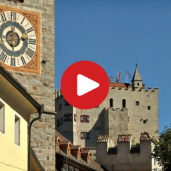 Brunico Castle has once been the summer resicence of bishops - after a period of restoration it hosts the Messner Mountain Museum and is dedicated to the hill tribes from all over the world. In the entrance area, there are several different tents and habitations of mountain people from all over the world, in the pic an expedition tent of the pioneering period. In some habitations you can even enter… that’s what above all kids love to do, but not only! A room on the first floor is dedicated to water, which is a gift by nature that enables people survive in mountain areas. Also part of the exhibition are a series of portals and doors from all over the world, that are meant to symbolise that visitors should feel like home in the museum. Paintings and drawings from all over the world decorate the walls of the museum. In the picture… the Everest base camp? This piece of art has been produced in four years of manual work, in the Orient. The architecture is the central theme on one of the upper floors - model buildings make you grasp the differences between the different cultures. The rooms of the bishops remained in their original state and have not been modified in the period of restoration. The stairwell has been added in the course of the restoration works. It’s really worth scaling the steps, as the view you can enjoy from the donjon is just amazing. View on the city of Brunico. To conclude a visit, we recommend you a coffee in the inner courtyard, a place to stay at. 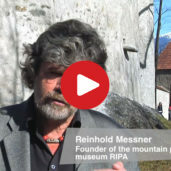 After a long period of restoration, in July 2011 the Messner Mountain Museum Ripa, the 5th in the circle of the museum project by Reinhold Messner, was inaugurated. Brunico Castle, once the summer residence of the prince-bishops, is today dedicated to the hill tribes from Asia, Africa, South America and Europe. From the Touareg to the Massai, Mongolians, Sherpas, Turkmens, Beduines and the Walser, the exhibition focuses on about 25 mountain people. Messner spent a total of 10 years of his life with hill tribes. In this experience he learned that the basis, that is to say the respect for nature and religion, are the same with all people, even if there are also great differences. The tour in the museum starts with an exhibition of different tents and habitations of mountain people. Odours, music and video projections enhance the sensation of being in another world and being on a world cruise. Europe and America as well as religion and partial aspects of life are at the centre stage on the upper floors. Moreover there is a room that is dedicated to the architecture of hill tribes. Also worth visiting are the prince-bishops’ rooms that have been unchanged also in the course of the restoration works. To conclude your tour, we recommend you to walk up the more than 100 steps to the panoramic viewpoint on the donjon. This is where you cannot only enjoy a great view on Brunico, but also the entire valley basin, to the three-thousanders of the Valle Aurina. Messner above all appreciates the site of the museum, because from here you can see a multitude of mountain farmsteads in the surroundings. A coffee in the open air café in the inner courtyard of the castle makes your visit complete.